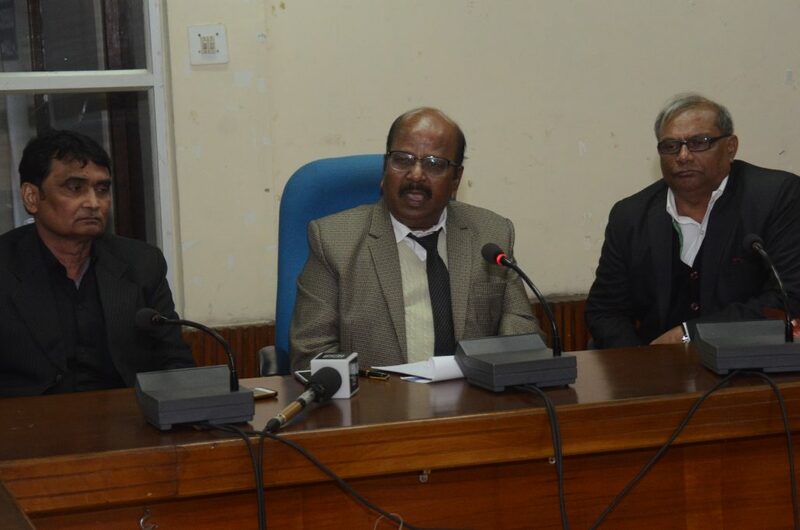 Chairman, National Commission for Safai Karamcharis, Manhar Valjibhai Zala addressing a Press Conference in Shillong on February 4, 2019 evening. Image: Northeast Now. The National Commission for Safai Karamcharis (NCSK) on Monday visited Meghalaya and reviewed the implementation of schemes for the welfare of safai karamcharis (sweepers). The state level review meeting was chaired by National Commission for Safai Karamcharis (NCSK) chairman, Manhar Valjibhai Zala. Speaking to reporters, Zala said that the state level review meeting was held where officials of the state government including chief secretary, deputy commissioners and officers of municipal boards were present and discussed with them the implementation of schemes for the welfare of safai karamcharis. Emphasizing the need to provide facilities to the sanitation workers, Zala also wondered at the refusal of safai karamcharis to shift to houses built by the state government. “I appeal to safai karamcharis to shift from the old place they stay to the quarters built by the government so that they have better facilities,” he said. The state government has built quarters but at present, the quarters are being used as temporary office of the Shillong Municipal Board. Zala said that the Commission has recommended to the state government to address the problems face by sanitation workers and implement various welfare schemes including accommodation facilities, including the need to construct houses under the Pradhan Mantri Awas Yojana (PMAY) scheme. At present some sweepers are still residing at Them ïew Mawlong, a commercial area which is not hygienic. Some settlers at Them ïew Mawlong opposed the move to shift them to other places on the ground that they have been staying there for several decades. Zala also suggested the government to change the name ‘safai karamcharis (sweepers)’ to some other encouraging names, adding that the government should also give awards every year to those safai karamcharis who performed their duty well.